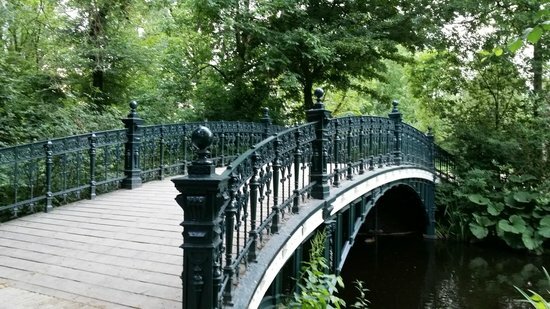 Vondelpark, a must-see when visiting Amsterdam, is often compared to Central Park in New York. This lush, picturesque landscape, surrounded by trees, scenic canals & little lakes, is the perfect time-out from the city. This 47-hectare public urban park was designed and built in 1850 and today is a popular place for tourist and residents, who can enjoy a variety of outdoor activities such as biking, hiking, jogging, romantic picnics and dog walking. There is also free live entertainment with bands ranging from Jazz to Blues. Feast your senses on rose gardens with more than 70 different types of roses; admire winding canals, contemporary sculptures, lakes and an open-air theater, and then grab a cup of tea after at the tea house. It’s the perfect place to relax and unwind. Amsterdam is the world’s most bike-friendly city & Vondelpark is ideal to enjoy and explore by bike. Rent a bicycle and ride around the park. You can stop off for a picnic, or eat at one of the numerous, delicious restaurants along the way. The park is picturesque throughout the year, but the Autumn leaves are particularly spectacular. In summer (June until the end of August) you can watch shows at the gorgeous open-air theater. Even in the rain, the weeping willows, small lakes, charming bridges and peaceful paths, all surrounded by beautiful buildings of the most prestigious area of Amsterdam are irresistible. At Vondelpark, you can experience all that nature and this fabulous city, has to offer.